The inspiration for this dish was provided by Richard McGary’s Salmon Roulade with Cilantro Citrus Pesto on Mango Corn Salsa, but it is quite different. 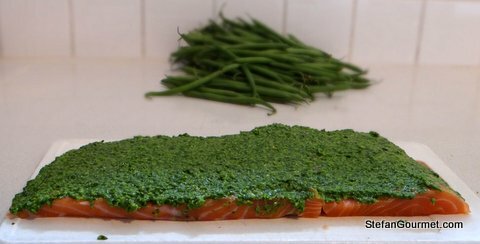 A salmon fillet is butterflied, filled with a basil-lemon pesto, rolled up into a roulade, cooked sous-vide, and cut into slices that are served on haricots verts. 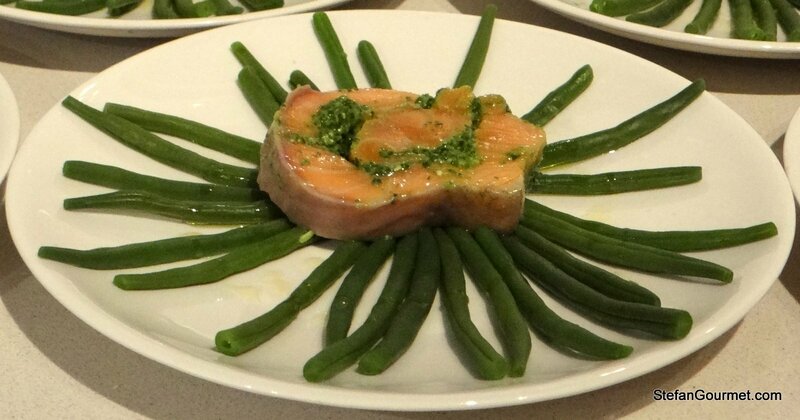 Salmon cooked sous-vide to 43C/109F is amazingly velvety, which contrasts nicely with the crispy haricots verts. The round buttery flavor of the salmon is complemented by the fresh taste of the basil-lemon pesto. Cheese and fish are rarely combined in Italian cuisine because cheese overpowers the delicate flavor of fish, which I why I created a pesto with the cheese substituted with lemon juice and zest. Unlike meat, fish is easily overcooked sous-vide. The tricky part about this dish is that if the roulade is too thick, the outside will be overcooked before the center is cooked. The roulade will then fall apart when you take it out of sous-vide, and it will be impossible to slice and serve it. This means that the piece of salmon fillet used for this should not be too large. 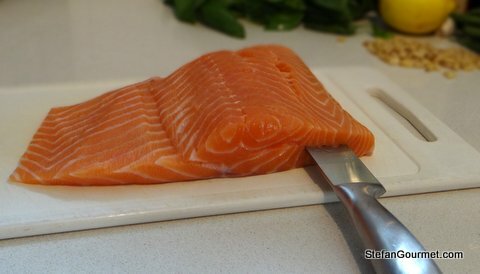 If you are particularly worried about this or have purchaed a particularly wide piece of salmon fillet, you could even trim the salmon fillet and use the remainder for another dish. If you do not have sous-vide equipment, you could also prepare this dish in the oven. 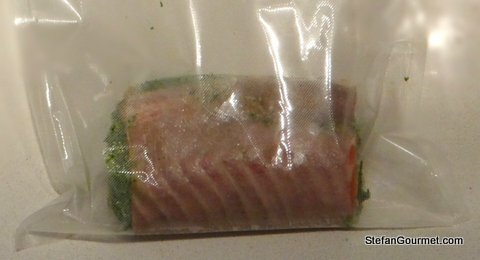 The salmon will not be as succulent as the sous-vide preparation, but it will still be delicious. Please refer to Richard’s recipe to find out how to cook it in the oven. It is fine to use good-quality fresh farmed salmon for this. 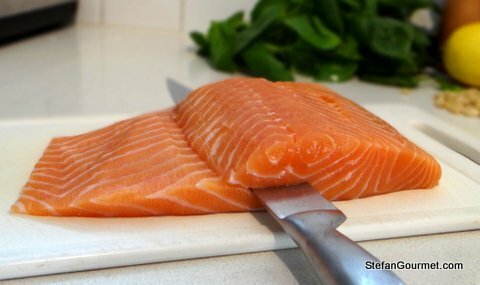 Use wild salmon only if it is fresh and has not been frozen, because wild salmon is dry as it is and freezing makes it even drier. Butterfly the salmon by cutting from where it starts to get thick. Cut until about 1 cm (1/2″). Fold open the salmon, skin side down. If needed you can flatten it by covering it with plastic wrap and lightly pounding it with a frying pan. 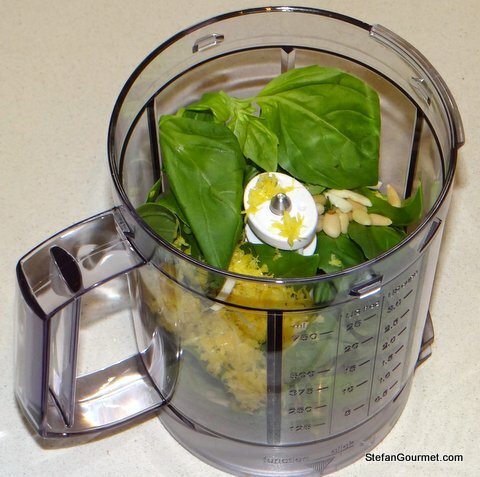 Combine the basil, garlic, pine nuts, lemon zest, lemon juice, salt, and pepper in the blender. Process on low speed, scraping down the sides as needed. Add just enough olive oil to give it a creamy consistency. 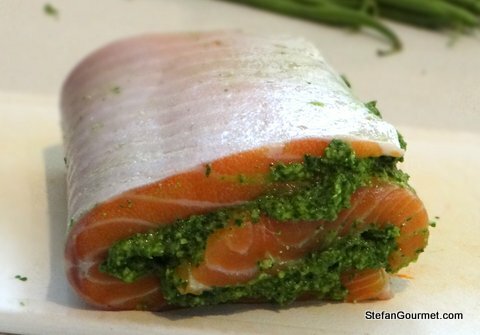 Spread out the pesto evenly on the salmon fillet, leaving about 1 cm (1/2″) or so bare at the edges. Roll it up carefully. 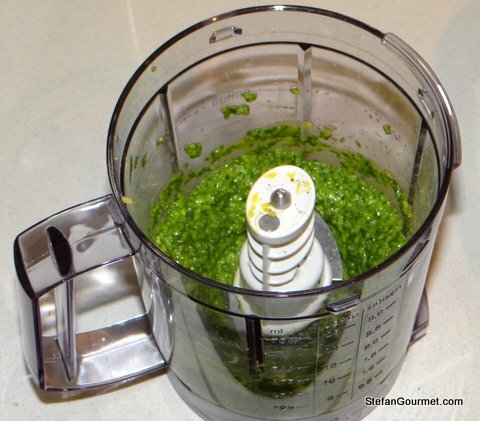 Do not press too hard, or too much of the pesto will be forced out. 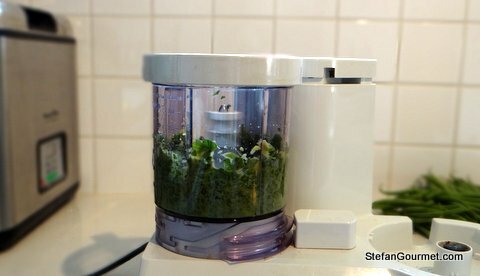 A vacuum sealer cannot be used, because that would force out most of the pesto. 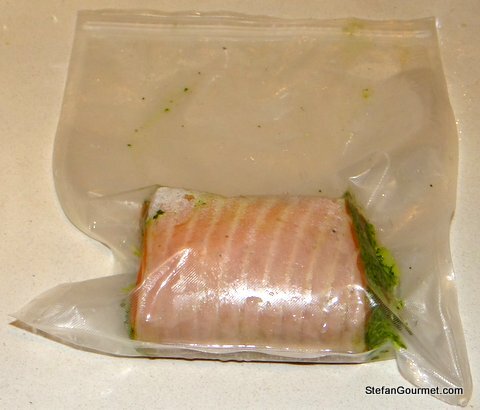 Insert the salmon into a ziploc sous-vide pouch instead. Seal the ziploc pouch with as little air as possible by submerging it into water and sealing it when only the zip is still above water. The water displacement will force out the air. You can store it like this in the refrigerator, or go straight on to the next step. Preheat your water bath to 43C/109F and cook the roulade sous-vide for 1 hour at 43C/109F. Meanwhile, snap the ends off the haricots verts. Boil or steam them with some salt for about 8 minutes or until they are cooked but still have some crunch. 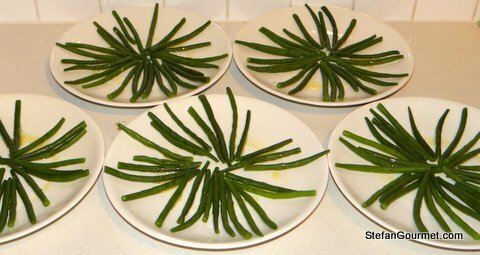 Arrange the haricots verts on the plates in a star pattern and drizzle with a bit of extra virgin olive oil. When the salmon is cooked, carefully take the roulade out of the pouch with your hands. It will break very easily. Cut into five slices and arrange the slices carefully on the center of the plates. 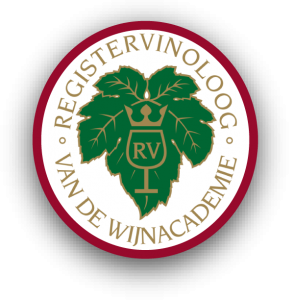 This is best with an elegant dry white wine that has some roundness to go with the buttery salmon as well as some freshness to go with the lemon. We enjoyed it with a Fiano di Avellino, but an unwooded Chardonnay-Semillon or Pinot Grigio would also work. That would work for sure. Italians might also add capers and anchovies to such a sauce. Nicely done, Stefan and I love the plating. I would imagine the flavor combination is remarkable with the haricot vert. I also like the added textural element you get with the haricot vert. Very, very nice. Thank you Richard. I’ve combined haricots verts with pesto for years, which also works well with regular (cheesy) pesto. This looks wonderful, as always! We just got back from a trip to Italy where we had a delicious lamb dish that I suspect was cooked sous-vide. The meat was evenly colored and melt in your mouth tender, but the tiny chops were also crispy on the outside. My husband said they tasted like they’d been boiled! He didn’t like them as was expecting grilled. I said aha! This may in fact be sous vide – what do you think? Great to hear you were in Italy — hope you’ve had a great time! It is quite unlikely that it was cooked sous-vide in Italy, unless it was a very fancy restaurant (probably with Michelin stars). “Boiled” doesn’t sound right either. The inside of lamb chops should have been very similar to grilled rather than melt in your mouth tender, but more uniformly medium rare right to the edge. Of course a grilled/smoky flavor can only be achieved by actually putting the meat on a grill (which could be done after cooking it sous-vide). Lamb shoulder or a similar cut could be cooked sous-vide to ‘melt in your mouth tender’, and that could seem ‘boiled’ if not prepared correctly. This looks beautiful. Do you need a certain type of equipment to cook this way? I’d never heard the term ‘sous vide’ until now! You can also cook it in the oven and then it will look as beautiful, the salmon will just not be as succulent. Well, I don’t have a sous-vide as you know 😦 … I just finished making a batch of pesto sauce for upcoming post (over pasta), and now you gave me another use for my pesto sauce. Thanks, 😀 Fae. 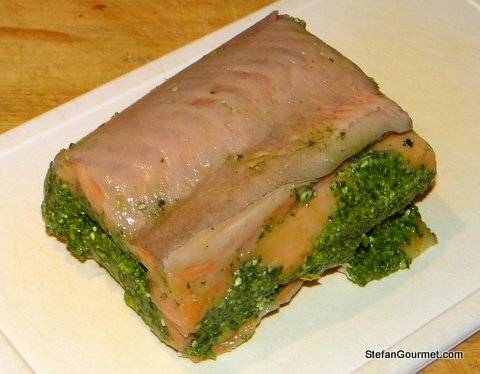 That is a beautiful piece of salmon that you used, Stefan, and preparing it Sous-Vide seemed to work very well. Top it off with another beautiful presentation and this is one great post. Though there is no sous-vide equipment in my near future, I can — and will – replicate this in the oven. Another great post, Stefan. Thanks for sharing. Great posting Stefan. Excellent presentation. I love the basil too. The leaves look huge. We are suffering from ‘winter’ basil here at present. It does not grow on the windowsill so we have to take what is on offer. Never good, I’m afraid. Thanks Conor. Our basil is imported, from Israel I believe. Is there anything you can’t sous-vide? I seem to remember you said you couldn’t sous-vide cake but I think that was because I was pissed and mistakenly asked you if you could. 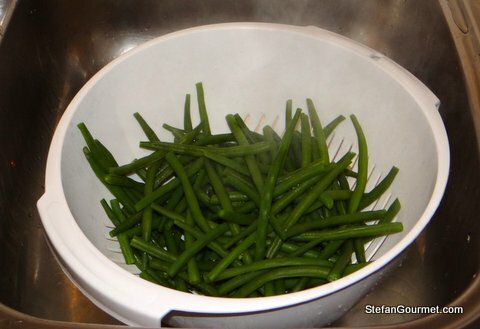 Oh how pretty, Stefan, a truly lovely play of colours and textures … and the green beans arranged like stars on the plate! Your posts are sheer delight … thank you. Thanks for the nice compliment, Jo! 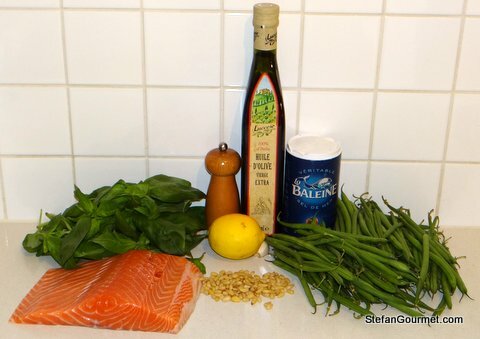 Salmon, pesto and beans are one of my favorite combinations. The lemon is so fresh and highlights the fish – and of course your presentation is perfect. 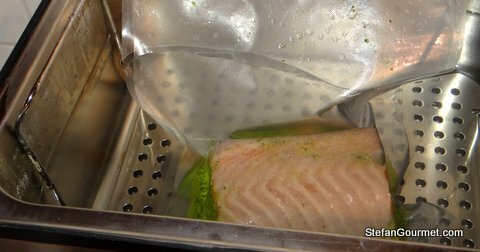 The sous-vide must make for tender salmon.